He’s not writing about us again, is he? “I’m looking forward to all sorts of things,” exclaims Matthew Crawley. 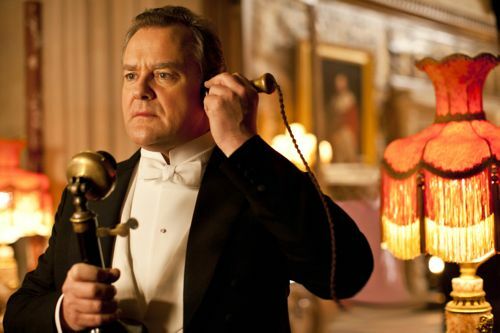 He’s talking to his wife-to-be Lady Mary in the first episode of Downton Abbey series three. I’m guessing you’re also looking forward to all sorts of Downton fun in the coming weeks. So you will find only the mildest of spoilers below. 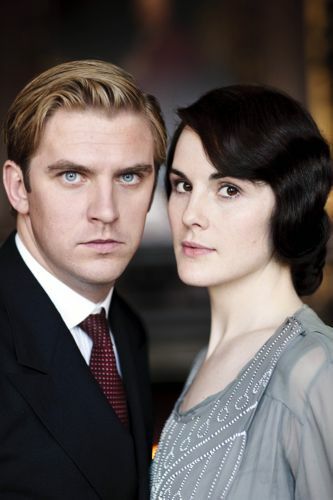 Will Matthew (Dan Stevens) and Mary’s (Michelle Dockery) wedding go ahead without a hitch? Or will there be last minute complications? 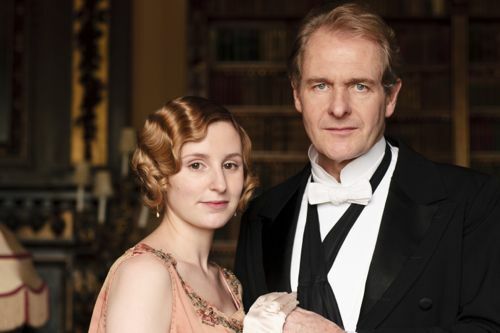 Can Downton be saved in the face of a financial crisis? And how long before Mr Bates (Brendan Coyle) hits his cell mate? I saw the 90 minute opening episode and highlights from the rest of the series at the London press launch way back in July. The verdict of the massed ranks of Her Majesty’s Press? 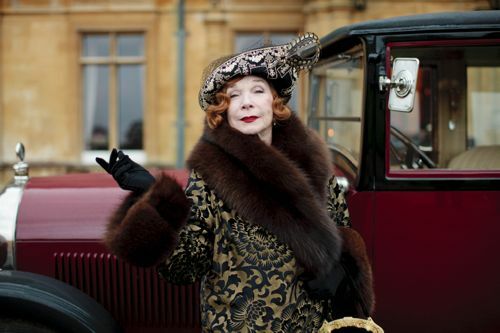 Julian Fellowes’ Downton is very much back on top form. 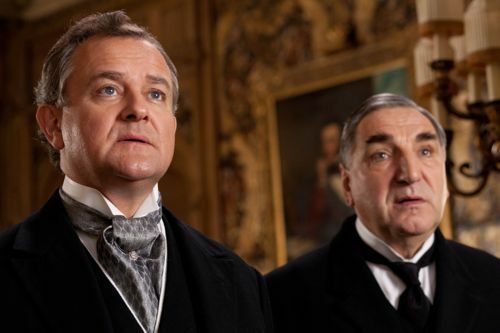 I know Lord Grantham (Hugh Bonneville) and co have their critics. But, frankly, I could watch Mr Carson (Jim Carter) saying, “That treacle tart just hit the spot,” all night long. Not least the much trailed arrival of Shirley MacLaine as Cora’s mother Martha Levinson. Adding an extra dimension to life at the big house in the early part of the series. 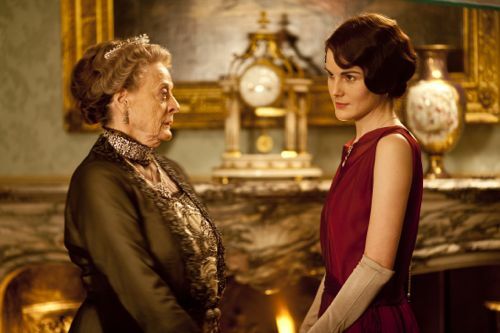 Including some delicious sparring involving Ms MacLaine and Dame Maggie Smith as Violet, the Dowager Countess. It’s Spring 1920 as the new series begins. Daisy (Sophie McShera) is wheeling her bike towards the village. Inside a wedding rehearsal is underway for Matthew and Mary’s big day. Filming of eight new episodes plus a Christmas special started in February and ended in mid-August. So the cast were still making the new series when we spoke to them. The press preview was followed by a press conference and then by a series of round table interviews. Below are some extracts from the “upstairs” round tables. Which left me hoping we will meet Tinky Bonky later in the series. There will be more to come on another day from those who also serve – or are in prison. Including Joanne Froggatt, Brendan Coyle, Lesley Nicol, Sophie McShera, Rob James-Collier, Jim Carter, Amy Nuttall, Siobhan Finneran and Phyllis Logan. 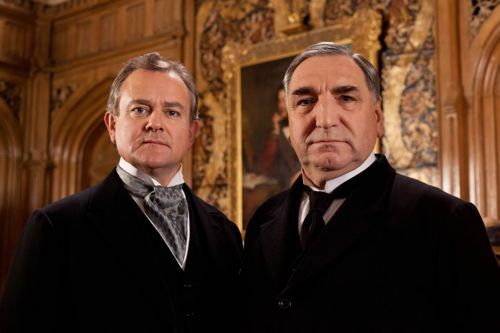 Downton Abbey returns to ITV1 at 9pm on Sunday (September 16) and will be screened in America from January 6. “It’s not snowing anymore. The inevitable stress of wedding preparations takes its toll, amongst other things. We’re in 1920 now. “The scripts are a constant surprise. We get them two at a time, generally. It’s interesting, hanging in the balance really as to where everything goes and where we all end up. Any recent surprising encounters with famous fans? Being spotted by American fans? Did she decide she’d met you in another life? Matthew and Mary in this third series? Will viewers be surprised? 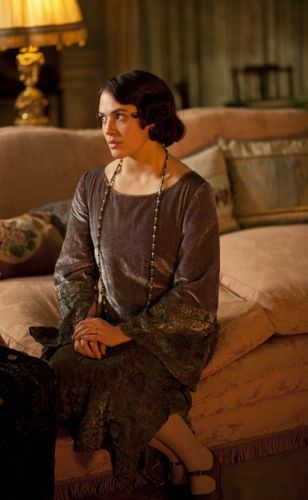 Have any of Downton’s standards of etiquette made it into your everyday off screen life? Any dancing in this series? “We’re now engaged, as you remember, from the end of series two. The wedding plans are underway. But whether bells ring or not, you’ll have to wait and see. It’s never plain sailing with Matthew and Mary. “Gary Oldman we ran into at an event in New York and he’s a fan. So that was nice to hear because we’re all fans of his. “It’s beautiful, as you can see. It was a long process, the design. It will be interesting to see how it influences women in their own weddings. Downton has had quite an effect on fashion in the past few years and I’ll be interested to see if there’s some copies – people attempting to copy it. Will viewers be surprised by Mary and Matthew in this third series? Shirley MacLaine took a while to get used to Julian’s writing? Robert is proud that his daughter is due to be married? “Yes. Matthew and Mary continues to be…it’s not an easy ride along the way. 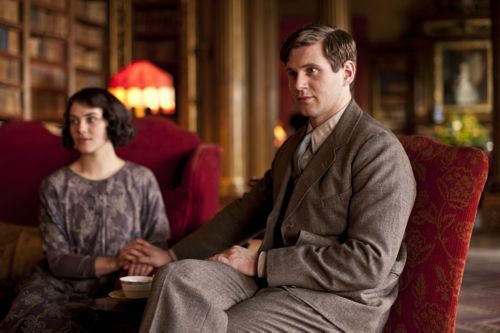 And then obviously Sybil and Branson and there’s dear Edith, who’s got her intentions. So I think he’s probably a bit like Mr Bennet – sort of wants to get rid of them and go and sit in his study. Does the money crisis test the marriage? Financial crisis at Downton? Cora able to cope more with the news than Robert? What’s it like having another American on set? “Well, there was having another American on set and there was having Shirley MacLaine on the set. I think having Shirley MacLaine on the set speaks for itself. Having another American on the set was very reassuring and nice. It was having a compatriat that understands where I’m from and what that means. So it was really nice for me. It was reassuring. It was like a balm. 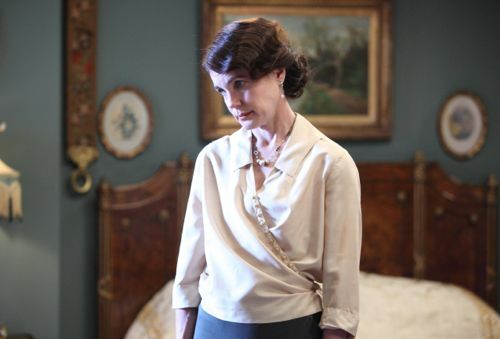 It looks like Lady Edith won’t have a straighforward series? Tell us about the people you met at the Met Ball in New York? “Oh yes. So Michelle and I went. It was fabulous. We met Mick Jagger. Brooke Shields came over and was very nice. Martha Stewart came over and was very nice. Beyonce was there – who I am obsessed with. It was crazy. It was a room full of very famous, beautiful faces. And the oddest thing was, they seemed to know who we were. They all watch the show. And it was my first trip to America since the show’s been on. So it was incredible. Does Sir Mick watch Downton? Acting with the prosthetic baby bump? Does she have any regrets? Is she still quite political? “She is. I think now, because of the fact that Tom and her are married there is also a huge…she’s followed in the footsteps of feminism and she’s broken out. She works. She’s been nursing in Dublin at the time but I’ve just heard the scene’s been cut. So who knows? I haven’t seen the rest of the cuts of the other episodes. Huge impact of Downton around the world. But for you, when you turn up at 6am on set, it’s a job with a working company of actors? “Yes. Big change. They don’t have a penny. He starts working for a newspaper back in Ireland which pays him a pittance. So they’re mainly living off Sybil’s allowance. It’s something that Branson doesn’t really want. Looking at it when they left for Ireland, they had a rose-tinted version. The harsh reality has hit home. Especially now with baby en route. Does Tom have any regrets? “I think Branson has some regrets. Mainly that he didn’t steal more silverware on the way out to pawn. Tom forges a relationship with Matthew? Plus the Irish Question is highlighted? Branson is centre stage with big speeches at dinner after being in the background? And you went back to Ealing to film a downstairs scene in episode one? Well, at least it was freshly ironed. Posted in Downton Abbey, News and tagged Allen Leech, Dan Stevens, Downton Abbey, Elizabeth McGovern, Hugh Bonneville, ITV Drama, Jessica Brown Findlay, Julian Fellowes, Laura Carmichael, Maggie Smith, Michelle Dockery, Shirley MacLaine. Bookmark the permalink. Just watched the 2nd season in time to get ready to watch season 3 – can’t wait!